Hämmerle Williams is a contender for best eau-de-vie… bar none. If you make fancy pear Brandy in France, the liquor snobs swoon with delight. But some of the best pear Brandy in the world is made in Austria. But because the Austrian word for fruit brandy is “Schnaps” the spirits snobs often turn up their noses. Don’t make that mistake. 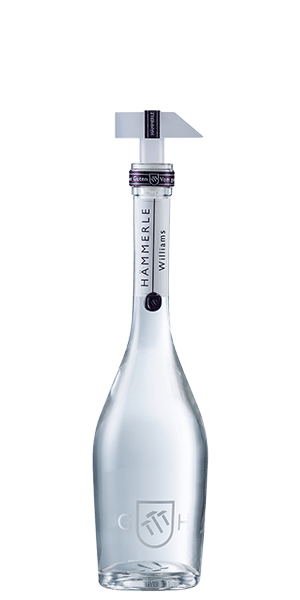 Hämmerle Williams is a delicate and delicious pear Brandy — Schnaps — made in the traditional way with superior distillation. The result is a lightly sweet, almost creamy spirit that springs from the eau-de-vie of local pears grown in the alpine mountain valleys near the Freihof Distillery. And we have to say, of all the wonderful Hämmerle branded spirits, this is our personal favorite. It’s simply delectable. The Williams pear full name in its native France is “Williams’ bon chrétien.” In North America it is often called the Bartlett pear. Many producers consider it to be the best pear varietal for making Brandies. What does Hämmerle Williams Pear Brandy taste like? The Flavor Spiral™ shows the most common flavors that you'll taste in Hämmerle Williams Pear Brandy and gives you a chance to have a taste of it before actually tasting it.